There aren’t many camps running during the fall. But autumn at Camas Meadows is one of my favorite seasons. 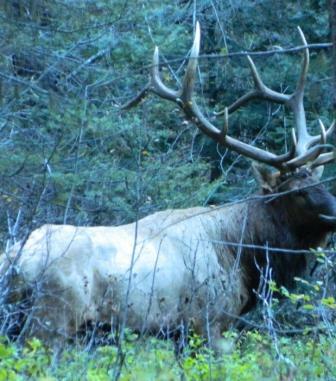 Frost in the mornings, bright sunny afternoons, chilly starlit evenings, and the sound of bull elk bugling and fighting in the undergrowth through the window at night. When I was a little girl the meadow supported a herd of 200 elk. Now there are only twelve. 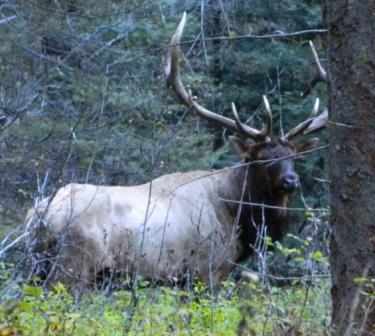 But they are still lovely to behold and the boys and I are on the lookout all fall for Big Boy, the king of the forest. There are several bulls on the meadow this year and they spend their days fighting it out over a small herd of lovely ladies. 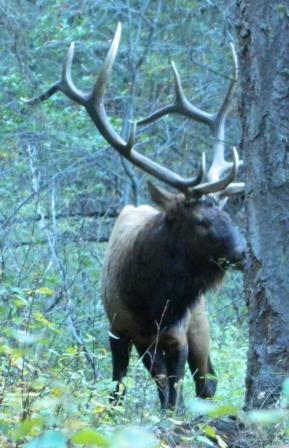 For the boys it is not enough to get a glimpse of these beautiful animals, they want to see the biggest strongest most fearsome elk on the meadow. They want to see Big Boy. First we would see one bull and yes he was impressive. Surely he was the one. But no, the cow elk were nowhere to be seen. Then another bull would bugle and brandish his antlers and we were completely convinced. But again the cows were not. Finally we found him, Big Boy, the king of the forest. Of course he was always hiding behind a tree or branch, but I did the best photography I could. And so here for your viewing pleasure is Big Boy. Three different views of Big Boy, in all his glory, as well as some branches and trees.